Can Botox Lift Your Eyebrows? Botox is most commonly used to treat facial wrinkles and creases like forehead lines, crow’s feet, and frown lines, and is also being used as a preventative measure against future wrinkles. Botox essentially works by relaxing your muscles. An injection of Botox takes just a few moments, and results can last anywhere from three to four months. As you can see, Botox has many different uses. But can it lift your eyebrows? Take a look below. The short answer is yes, Botox eye injections can absolutely be used to provide a brow lift. Botox is a great option for those looking for more natural results and are looking for a less expensive way to create the effect of lifted eyebrows. 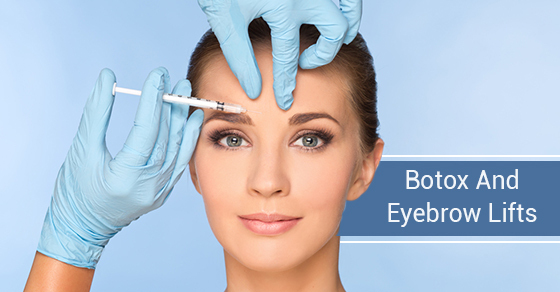 Since Botox needs to be injected at strategic points to achieve the desired results, it is imperative that you book your eye surgeon, Dr. Skouras. It is also important to mention that not everyone is a candidate for this procedure, so a consultation will be needed. If you are a candidate, Botox eye injections would be typically injected in three distinct areas, including the outer eye muscles and then in the centre of the glabellar complex. In some cases, just the tails of the eyebrows are treated, but optimal results are achieved if all three points are injected. The amount of Botox in each injection will depend on the patient. You can read more about Botox on our website, here. If you are interested in Botox, consider Skouras Eye and Cosmetic Centre. We are a leading cosmetic surgery center in Toronto. To schedule an appointment or for more information, contact us here.